Write a C program to compute the sum of the two given integers. If the sum is in the range 10..20 inclusive return 30. 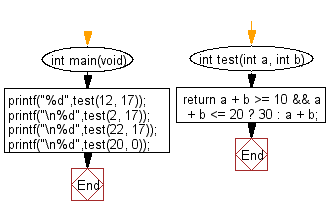 Previous: Write a C program to check if a triple is presents in an array of integers or not. If a value appears three times in a row in an array it is called a triple. Next: Write a C program that accept two integers and return true if either one is 5 or their sum or difference is 5.